Add luxury to roast chicken with truffles and a rich, creamy sauce made from homemade chicken stock. Perfect for a posh Sunday roast. 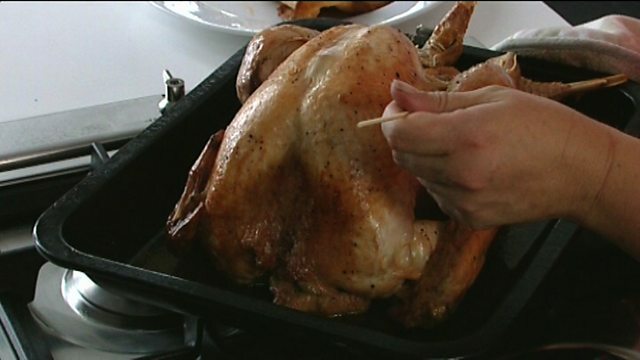 Put the legs and wings in a deep roasting tray and roast in the oven for 15-20 minutes, then set aside. Place the butter in a large bowl, add half the truffle, a little salt and pepper and mix. Lift the skin away from the chicken crown (leaving the skin intact) and push the butter underneath the skin. Place in a deep roasting tray and roast for 1-1½ hours, or until cooked through. When you think there is 30 minutes left add the carrot batons. For the sauce, heat a large saucepan and add the oil. Once hot add the onions, carrots, leeks, bay leaves and thyme and cook for 3-4 minutes. Add the legs and wings and cook for 2-3 minutes. Add 2 litres/3½ pints of water and cook for at least 1 hour. Strain and keep the liquid, but discard the vegetables. You will need 500ml/18fl oz of this chicken stock. Heat a sauté pan and melt the butter. Add the shallots and cook for 1-2 minutes. Add the garlic and cook for 1-2 minutes. Add the white wine and cook until reduced in volume by half then add the chicken stock and reduce by half again. Finish with the cream and chervil. For the kale and peas, heat a large sauté pan and melt the butter. Add the kale and peas and cook for 2-3 minutes, or until the kale has wilted. Put the roasted carrots, kale and peas in the centre of the plate. Remove the chicken breast, cut into slices and fan over the vegetables. Spoon over the creamy sauce, garnish with remaining truffle and serve.